Today, we had another early start, crossing into Rwanda and driving towards the capital, Kigali. 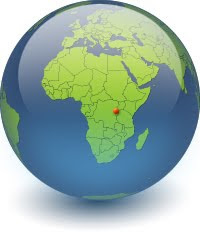 Rwanda is one of the smallest countries in Africa – slightly smaller than Massachusetts – and it is situated at a fairly high altitude, causing a cooler-than-expected climate for equatorial Africa. The lush, green landscape of Rwanda is even more beautiful than Uganda, and the kids are even more enthusiastic to see us, as they don't see many tourists. In countries like Rwanda that have a recent history of war, people are generally very happy to see tourists because it indicates that their country is safe again. Of course, they also are happy because it is a chance to obtain some spare change – calls of "mzungu, mzungu, give me money!" were plentiful. In one instance, a group of kids spotted us and began running down the road trying to catch up with our truck. The road, like most roads in Africa, was full of potholes, so the kids actually managed to catch up to our slow-moving truck. One boy leaped up and hitched a ride on the back of the truck until we began going too fast and he dropped off. The kids have a good sense of humor though – they laugh when we hold our hands out and tell them to give us money. Towns in Kenya and Uganda were marked by rows of building painted with advertisements for mobile networks and other products, but towns in Rwanda were distinctly more bare, as it is a poorer country. But the landscape was one of the most beautiful I have seen. Rwanda is know as the Land of a Thousand Hills due to its mountainous landscape of picturesque terraces, banana trees, and tea plantations. After a few hours, we reached Kigali, the center of which is built on a hill, with a few tall buildings under construction at the top. The surrounding areas are mostly comprised of earth-colored shacks. We visited the Genocide Memorial Centre, which was an eye-opening and incredibly emotional experience. The museum educates visitors about the causes that led to the Rwandan Genocide, starting with Rwanda's history as a German and later Belgian colony; progressing through the artificial colonial segregation of the society into Hutu, Tutsi, and Twa ethnic divisions; and climaxing in 1994 with the genocide of the Tutsis by the Hutus. Approximately 800,000 people were slaughtered, almost 20% of Rwanda's population. The museum does a good job of not censoring photos or other accounts of the torture and murder of genocide victims by machete, bludgeoning, or other brutal methods. The most moving section of the museum illustrates individual accounts of children murdered by cruel, inhuman means. I left with a much greater understanding of the apocalyptic nature of an event that absolutely decimated an entire country's population. Over half of Rwandans today are younger than 18. The Rwandan people remember and talk about the genocide every day, and the forgiveness and reconciliation that has occurred since 1994 humbles me. If you ask someone in Rwanda today if they are Hutu or Tutsi, they will reply, "I am Rwandan."